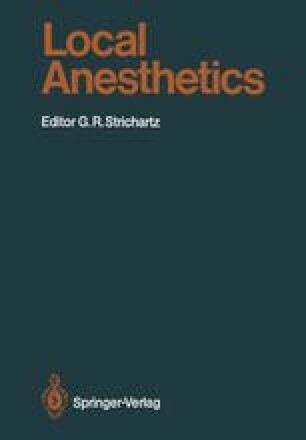 Local anesthetics are chemicals that reversibly block action potentials in excitable membranes. The generation and propagation of action potentials depend on the opening and closing of ionic sodium, and usually also of potassium, channels that span excitable nerve and muscle membranes (Hodgkinand Huxley1952; Hille1970). Both the shape of individual action potentials and the frequency of bursts of impulses are determined by the kinetic properties of these ion channels which, in turn, are controlled by the membrane potential of the cell. Local anesthetic molecules interfere with the function of these ion channels in such a way as to block the generation and conduction of action potentials (Taylor1959; Hille1966).